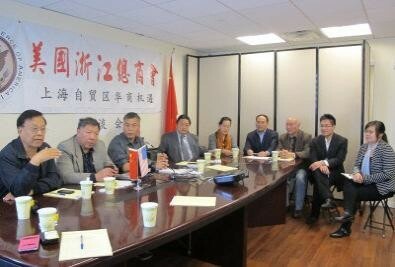 Zhejiang Chamber of Commerce of America (ZCCA) and other five organizations held “Shanghai FTA Chinese Business Opportunity” lecture on Oct. 23rd, which is about bringing overseas Chinese new business opportunities due to the establishment of FTZ. The vice president Ke Zhou introduced some information about Shanghai FTZ. Since 2008, the U.S. has been cooperating with TTP and TTIP but China, for China did not have a FTZ. Nowadays, Shanghai becomes a breach of China. President Ailong Zhang suggested that who enters the zone first gets the benefits. Both Chinese and American merchants could take advantages from three aspects. First, merchants could invest a variety of different kinds of business. Second, it is easier to establish a company in the zone. Third, trade costs have decreased. Such this much of freedom could never be imagined before. Vice-president Songlin Yang pointed out that the goal for establishing FTZ is to strengthen China’s own influence. He also thought that RMB would increase its value in the near future. President Zhongfang Dai added that the FTZ has mentioned three kinds of freedom: Goods Export& Import Liberalization, Investment Liberalization, and Finance Liberalization. He also thought that trading more freely is a good thing. However, the FTZ is still new to ZCCA, so taking a visit to Shanghai seems very necessary.